Ocean Drive recently asked us to contribute to its story on healthy versions of comfort foods. We really liked this spin chef Roel Alcudia had on The Cypress Room menu and wanted to offer you the full recipe here. It is not only simple to make, but as a local, casts stone crabs in a whole new light, from pick and eat with the traditional mustard sauce to an ingredient as a component of a dish. Stone crabs blow in with a torrent on October 15 each year and can’t come quick enough. 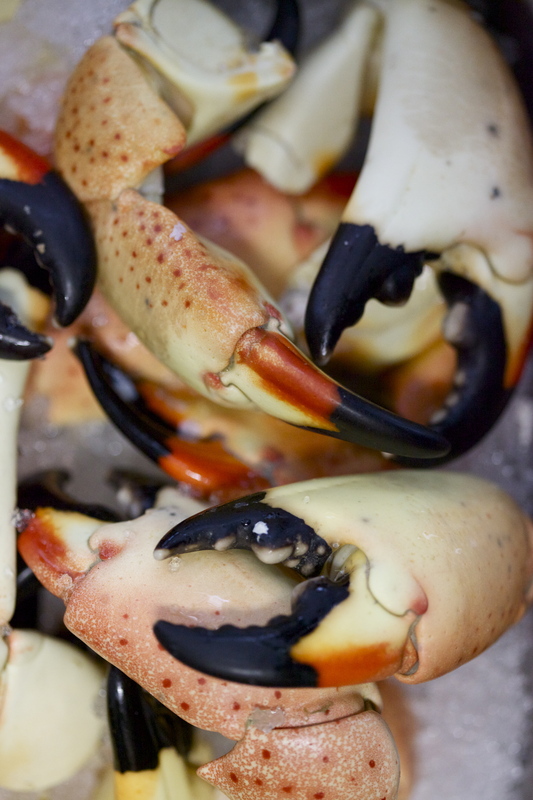 We source most of our claws from George Stone Crab and have been hot on them this season especially with our new raw bar at Michael’s Genuine. They were also a popular item on the menu at our Design Miami café last week. A roulade is a dish common to most European cuisines and consisting of a slice of meat rolled around a filling, which could be cheese, vegetables, or other meats. The term originates from the French word “rouler”, meaning “to roll”. Roel’s recipe is a heathy take on this typically rich, braised preparation, but no less decadent or soulful. And what’s more comforting than a taste of home? We’ll let you be the judge! George Stone Crab is one of our suppliers in the unique position to sell direct to consumer, so you can place your order for delivery here. In a small bowl, combine the crab meat, shallots, chives, citrus juice, celery, apples, cucumbers into a uniform mixture. Season with salt and pepper to taste. Spread a footlong sheet of plastic wrap horizontally on a clean work station. About 2 inches away from the edge closest to you, spoon the crab mixture to form a long baton 2-inches wide down the plastic wrap, leaving a couple of inches free on either end. Gently begin to roll and tuck the crab mixture into a compact dowel and twisting the edges to tighten securely. Refrigerate roulade for at least one hour. Make a remoulade by combining the mayonnaise, cornichons, capers, and champagne vinegar, seasoning with salt and pepper to taste. Remove chilled roulade from the refrigerator and using a sharp knife, slice 3-inch batons through the plastic wrap, carefully removing and discarding it to maintain each roulade’s shape. 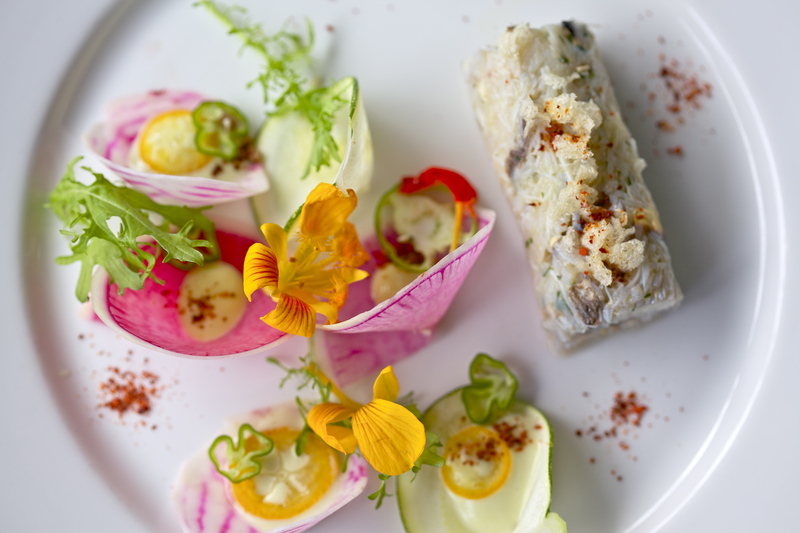 Serve immediately, placing each roulade on a plate surrounded by the shaved vegetables dotted with remoulade and slices of kumquat and a couple of pinches of Espellete pepper. Dress each lightly with the lemon juice and olive oil, and garnish with edible flowers. ← Treat Yo’ Self & a Friend: BOGO Out Loud this Holiday!